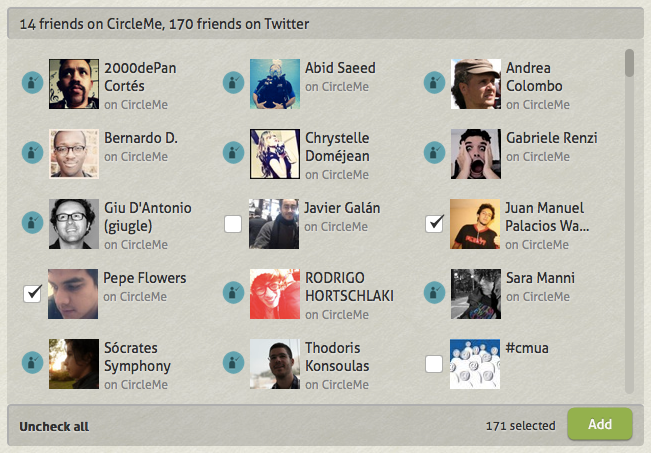 You can now invite your Twitter friends on CircleMe! Back in March we asked you on our Facebook page how you preferred to invite your friends to join you on new sites like CircleMe. Well, Twitter was the second most popular result just behind invites via Facebook and ahead of invites via email. Well, that’s right! Although just days ago we released the option to find and invite your Yahoo! Mail contacts on CircleMe, we’ve worked hard on it and from today, you can also invite your Twitter friends to join CircleMe! To find this new option, you simply have to go to the “Find people” page. Once you click on Find friends for Twitter, you’ll see a screen where you can select the contacts you want to send the invite to. Once you select the friends you want to add, then you simply have to click on Add. Then you’ll be requested access from Twitter for our Twitter app to send the invites… and voilà! You’ve sent the invites to your friends! We hope you find this useful! And if there is a service that you think we should add to CircleMe to find and invite new friends, do not hesitate to let us know! web I found this web site as a finest website for hottest updates. This article has truly peaked my interest. I’m going to book mark your website and keep checking for new details about once per week. I subscribed to your RSS feed as well. be sure to bookmark it and come back to read extra of your useful information.